The sixth annual Manufacturing Days were held on Wednesday, Nov. 14 and Friday, Nov. 16. This brought students from the five districts in Preble County are taken to different local factories. There they spoke with employees and learned what their jobs are and how they got where they are today. This is meant to show students one of their options after high school. EATON — The sixth annual Preble County Manufacturing Days were held on Wednesday, Nov. 14 and Friday, Nov. 16. A third day, Thursday, Nov. 15, was canceled because both schools participating — Twin Valley Local Community Schools and Preble Shawnee Local Schools — were closed due to inclement weather. At press time, a makeup day had not yet been coordinated. Preble County Economic Development Partnership (PCDP) Director Brenda Latanza hopes to reschedule those tours — to Cargill, Silfex, Neaton, and Parker Hannifin — in the near future. During Manufacturing Days, students from the five school districts in Preble County are taken to different local manufacturers. There they meet with employees and learn what their jobs are and how they got where they are today. This is meant to show students one of their options after high school. According to Latanza, Manufacturing Days wouldn’t have been possible without cooperation from Bullen Ultrasonics, Henny Penny, Pratt Lewisburg Corrugator, Neaton, TimkenSteel, Parker Hannifin-Eaton, Co-Chair Bob Fischer, countless chaperones, and Erin Harris and Leah Watkins from OhioMeansJobs. PCDP and Henny Penny donated KFC and Subway lunches to the students. 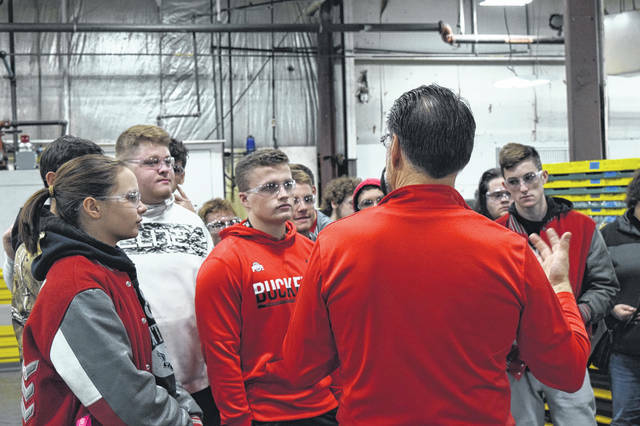 “For the last six years in November, Preble County manufacturers have been opening their doors to the five high schools in the county to show them what manufacturing is and what it is not. They address the skilled labor shortage they are facing with baby boomers’ upcoming retirements and current job openings, showcase different careers in manufacturing as well as discuss tuition reimbursement and other benefits the companies offer. These students and even teachers are walking away with a greater knowledge of what these globally recognized manufacturers produce and a different image of manufacturing,” Latanza said. For Tri-County North High School Principal Kristen Mills, the importance of manufacturing days is showing the kids that they have options after they graduate. “Any time we can create awareness and opportunities for our kids, so they can see what opportunities they have when they graduate and go into the workforce, armed forces, or college. It is our job to make sure they have the information they need. With Manufacturing Days, they won’t be able to tour facilities like this outside of today,” Mills said. For Tri-County North student Mason Dreischarf, his favorite part of the day was learning about the robotics utilized at TimkenSteel. “I learned quite a bit and it looks like a good job opportunity for many people. A lot of different career jobs that can be for anybody. People who aren’t sure what they want to do can get out here and learn about the different opportunities. I might be interested in something like this in the future, because I can come here with a degree or without and I could eventually move up the chain,” he said. https://www.registerherald.com/wp-content/uploads/sites/41/2018/11/web1_Timken2.jpgThe sixth annual Manufacturing Days were held on Wednesday, Nov. 14 and Friday, Nov. 16. This brought students from the five districts in Preble County are taken to different local factories. There they spoke with employees and learned what their jobs are and how they got where they are today. This is meant to show students one of their options after high school.